The Hong Kong International Education Consultants’ Association (HKIECA) was established on 30 November 2004 to enhance the professionalism of the industry. The idea to form HKIECA originated from a small group of professional and experienced education consultants who felt that there was a need to establish a body to uphold professionalism and regulate the industry. Members are companies registered in Hong Kong as education consultancies, who are recruiting students to Australia, New Zealand, United Kingdom, the USA, or Canada. Full Members must have an office in Hong Kong and be in operation in Hong Kong for two or more years. Companies that have been in operation for less than two years are eligible for Associate Membership if sponsored by two Full Members. 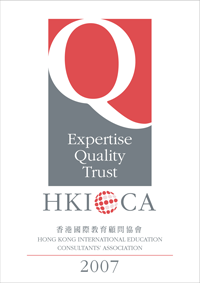 Each member will be recognible by an HKIECA Q-mark (see left) which they will place prominently in their office and on their promotional materials. A number of Sub-Committees have been established to provide members with the means to improve their services and expand their influence in the industry. HKIECA will also be a platform for education consultants in Hong Kong to come together to work for the benefit of the industry, the overseas education institutions, and the students and the community in Hong Kong.